The Theatre Royal on Humber Street, Hull should not be confused with the later Theatre Royal on Anlaby Road, or the Theatre Royal on Paragon Street, Hull which would later become the Tivoli Theatre. The Humber Street Theatre first opened on Tuesday the 2nd of May 1810 with a production of 'Tancred and Sigismunda', and was situated on Humber Street about half way between the end of Queen Street and the South end of the Humber Dock. This Theatre was actually the successor to an even earlier Theatre in Finkle Street, Hull, which had itself opened in 1770 but had been found less than adequate for its purpose, hence the building of the new Theatre Royal in 1810. 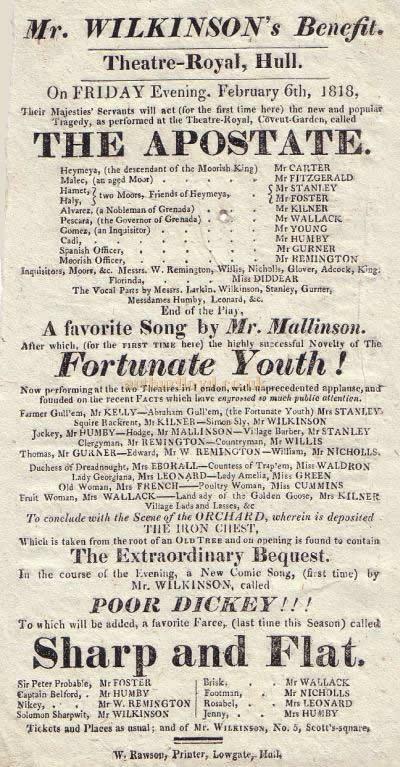 Right - A Bill for 'The Apostate,' 'Fortunate Youth,' and 'Sharp and Flat' on February the 6th 1818 at the Theatre Royal, Hull. The Humber Street Theatre Royal was some 125 foot in length and 60 foot in breadth and designed by the architect Mr. Mountain, with its main entrance on Humber Street. The auditorium consisted of Pit, two galleries, and two tiers of dress boxes, 16 in each, amounting to 32 boxes which could hold some 800 people. The middle gallery with its own boxes could accommodate some 700 people, and the upper gallery ran around the whole house. The galleries and boxes were supported by cast iron columns. The front of the boxes and galleries were painted pink with etruscan borders and the boxes themselves were lined with scarlet cloth and painted French Grey with wooden paneling. The stage proscenium was supported by pillars painted to resemble yellow marble and capped with an arched top and hung with crimson curtains, festooned, and ornamented with a gold fringe. The stage was 54 foot deep and below it were dressing rooms for gentlemen, whilst above these and behind the stage were dressing rooms for ladies, a manger's room, and green room. Sadly the Theatre was destroyed by fire on Thursday the 13th of October 1859 and all that remained after the fire had been extinguished were the containing walls. The proprietor, Miss Wilkinson, who was the daughter of the builder of the Theatre, had put the Theatre up for auction in May that year but it had failed to find a bidder. The ERA reported on the fire in their 16th of October 1859 edition saying:- 'The splendid Theatre Royal in this town was discovered to be on fire at seven o'clock on Thursday morning. Before eight, the roof fell in, and at noon, the whole of the magnificent structure was leveled to the ground. The building is insured, but the manager (Mr John Pritchard) and the actress whose wardrobe were destroyed, were uninsured. The cause of the calamity is not known.' - The ERA, 16th of October 1859. 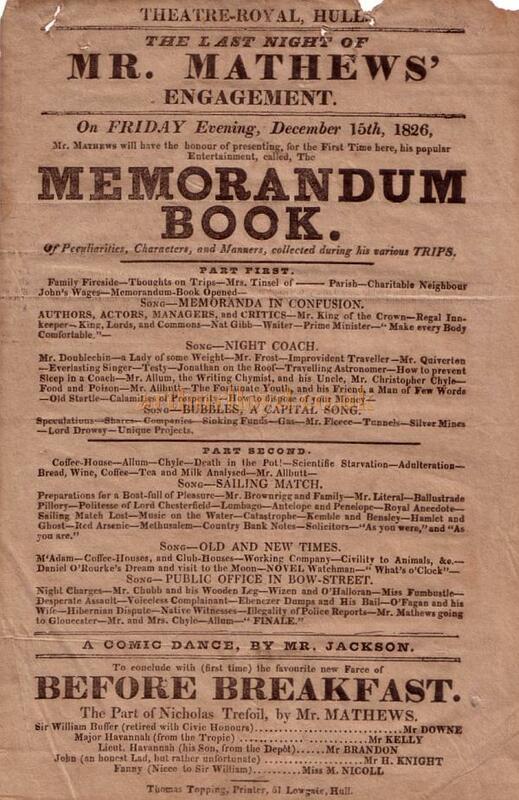 Left - A Bill for 'Memorandum Book' at the Theatre Royal, Humber Street, Hull on December 15th, 1826 - Kindly donated by Patricia Shepherd. The site of the Theatre Royal then remained derelict for some 6 years until the foundation stone of a new Theatre on the same site was laid by Lord Londesborough on Wednesday the 19th of April 1865. The Theatre reopened on Boxing Night, the 26th of December, 1865 with a production of 'A Wolf in Sheep's Clothing' and the pantomime 'Hop O' my Thumb'. The new Theatre was reported to be able to hold some 2,250 people with eighteen inches seating space each. The replacement Theatre of 1865 however, was not to last long as it was also destroyed by fire, only four years later, whilst under the management of Mr. Chatterton of Drury Lane, on the morning of Saturday the 6th of February 1869. The Theatre had put on a benefit for Lewis Nanton on the Friday evening, followed by a performance of the pantomime 'Robinson Crusoe' which had ended and the audience had left the building by 11.30. Shortly after this it was discovered that the property rooms beneath the gallery were alight and despite the efforts of the staff who were still in the building, the Theatre was completely destroyed. Right - A Blue Plaque commemorating the Theatre Royal, Humber Street - Courtesy Liz Bradley. 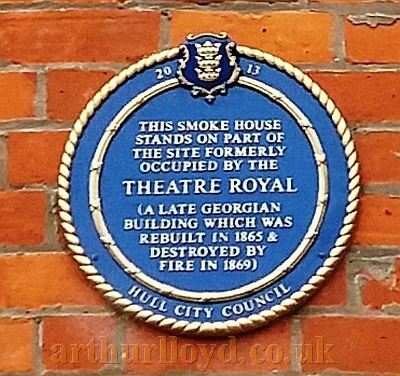 A Blue Plaque situated on the wall of a Smoke House building, which was constructed on part of the Humber Street Theatre Royal site, is all that is left to commemorate the existence of the Theatre today (See image Right). A new Theatre Royal on Anlaby Road was built to replace the Humber Street Theatre in November 1869, but this would soon be replaced by yet another Theatre Royal, this time built in Paragon Street, Hull, which opened a few years later in 1871.